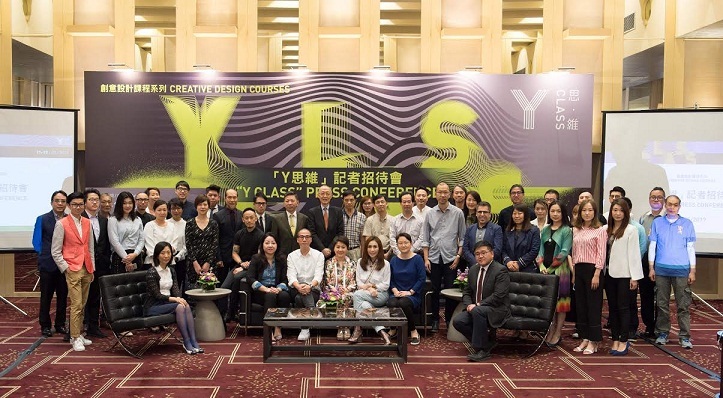 “Y Class” is a series of creative design courses mutually conducted by the Centre of Continuing Education of University of Macau and Chiu Yeng Culture Limited (“Chiu Yeng Culture”), with the key creative support from Chiii Design. The five-day creative design courses will be held from 11th to 15th July at the University of Macau to promote the education of creative design and cultivate talents, and to foster adequate economic diversification in developing the creative industry in Macau. The “Y Class” Press Conference was held at Regency Art Hotel on 25th May, inviting honourable guests including Ms. Vanessa Wong, Secretary-General of the Committee of Cultural Industries; Mr. Kong Ngai, Chief of Division of Continuing Education of Education and Youth Affairs Bureau; Mr. Patrick Lei, Associate Professor of School of Art of Macao Polytechnic Institute; Ms. Huang Guanghui, Associate Professor of Faculty of Humanities and Arts of Macau University of Science and Technology; Mr. Carlos Sena Caires, Assistant Professor of Faculty of Creative Industries of University of Saint Joseph; Ms. Angela Leong On Kei, Vice President of Dr. Stanley Ho Foundation; Mr. Bernard Yiu, Representative of Sociedade de Jogos de Macau, S.A.; Mr. Mike Chiu, Representative of Sociedade de Lotarias e Apostas Mútuas de Macau, Lda. ; Mr. Willie Tay, Representative of Regency Art Hotel; Ms. Priscilla Leong and Ms. Anna Cheang, Representative of Industrial and Commercial Bank of China (Macau) Limited; Mr. Alex Yu, Representative of Macau Hong Kong Terminal Ltd.; Mr. Keith Cheong, Representative of L’Arc Macau; Mr. James Chu, Representative of Macau Designers Association; Mr. Dirco Fong, Representative of Macau Design Centre; Mr. Clement Cheng, Representative of Macau Interior Design Commercial Association; Ms. Juku Cheang, Representative of Macao International Brand Enterprise Commercial Association, together with Dr. Leung Shing On, Director of the Centre for Continuing Education of University of Macau; Ms. Sabrina Ho Chiu Yeng, Managing Director of Chiu Yeng Culture; Mr. Mann Lao, Creative Director of Chiii Design, to witness the announcement of “Y Class” Creative Design Courses. “Y Class”, as an extended project of “Y Show”, focuses on five design categories: Product Design, Visual Arts, Spatial Design, Visual Communication Design and Multimedia Design. By inviting design specialists from Russia, Beijing, Shanghai, Hangzhou, Hong Kong and Macau as instructors, “Y Class” will enhance students’ critical thinking skills and knowledge about design through academic and practical teaching method. “Y Class” aims to expand students’ design knowledge and increase their interest and desire to learn, and to help students in acquiring creative design skills that could be applied into the design industry. Also, this fosters the development of the non-gaming sectors in Macau, promoting economic diversification, hence increases the economic competitiveness of the city. “Y Class” is not designed only for design-majors, but also everyone who is interested in creative design. The second “Y Show” is also happening from 13th to 16th July at the Regency Art Hotel, with the continuous support and participation from five local institutes: University of Macau, Macao Polytechnic Institute, Macau University of Science and Technology, University of Saint Joseph and City University of Macau; and also support from overseas participants: Federation of Hong Kong Industries, Design Council of Hong Kong, National Taiwan Normal University, China Academy of Art, Shantou University, Kuwasawa Design School and Berlin University of the Arts. The joint exhibition displays art works in five main design categories throughout the venue: Product Design, Visual Arts, Spatial and Architecture Design, Visual Communication Design and Digital Media Design. An assessment committee will be formed by famous designers to select the top 10 outstanding art works and the students will be awarded with the Outstanding Award as to encourage potential talents to shape their career path in the design-related industry. “Y Show” also provides direct job opportunities for graduates through inviting enterprises and designers to seek potential talents at the exhibition. Course Requirement : Students need to achieve 80% of class attendance and attend the closing ceremony in order to acquire the course certificate offered by University of Macau. The second “Y Show” is strongly supported by various enterprises and organisations, with the endeavour to support the local cultural and creative industry. Special Supporter: Cultural Affairs Bureau of the Macao SAR Government. Sponsors include (in no particular order): Dr. Stanley Ho Foundation, Sociedade de Jogos de Macau, S.A., Sociedade de Lotarias e Apostas Mútuas de Macau, Lda., Meg-Star International Company Limited, Poly Auction Macau Limited, Regency Art Hotel, Industrial and Commercial Bank of China (Macau) Limited, Antalis (Hong Kong) Ltd., Tipografia Macau Hung Heng Ltda., Macau Hong Kong Terminal Ltd., Ying Hai Travel, L’Arc Macau. Supporters include (in no particular order): Macau Designers Association, Macau Design Centre, Macau Interior Design Commercial Association, Macao International Brand Enterprise Commercial Association, Shenzhen Graphic Design Association, Guangzhou Design Week. Media partners include (in no particular order): NetEase Media, Good Media Production Co. Limited, Manner Production Ltd. The second “Y Show” will be held from 13th to 16th July 2017 at Regency Art Hotel. Admission is free of charge. For details regarding “Y Class” and “Y Show”, please visit the official website: www.chiuyengculture.com.